This One Pan Cauliflower Mac and Cheese recipe is a healthy, low-carb recipe that will satisfy your cheesy cravings. Makes a delicious and quick meal or a perfect Thanksgiving side dish. Because that is what we do. A lot. On just about everything. What does that have to do with this One Pan Cauliflower Mac and Cheese? Everything. My kids love cheese but vegetables? Now that’s another story. Just the slightest idea that there *might* be a vegetable near their plate can send them into a tailspin meltdown. Thankfully most vegetables can be improved by adding a little – or in our case, a lot – of cheese. Cheddar, Jack, Parmesan, we’re not picky. 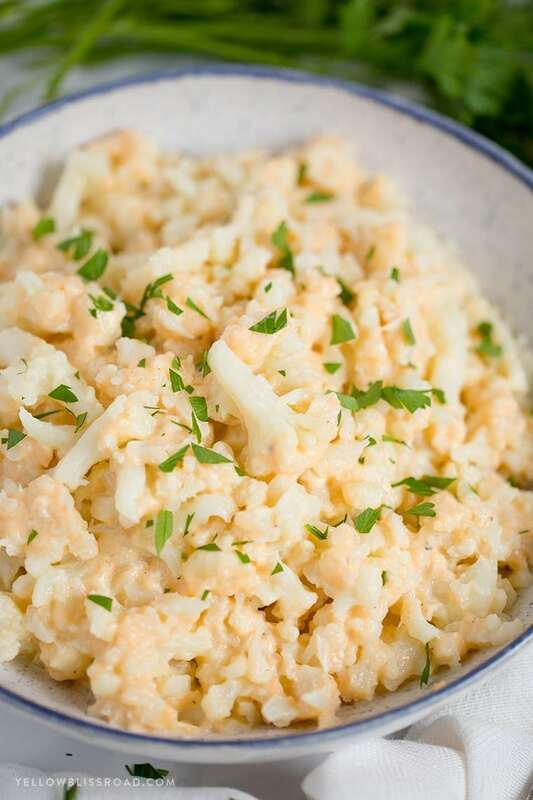 For this cheesy cauliflower dish, I opted for cheddar and Parmesan, but you could swap these out for your favorites. Now in case I threw you off with the whole “Mac & cheese” description, let me explain. This One Pan Cauliflower Mac and Cheese tastes like traditional Mac & Cheese. 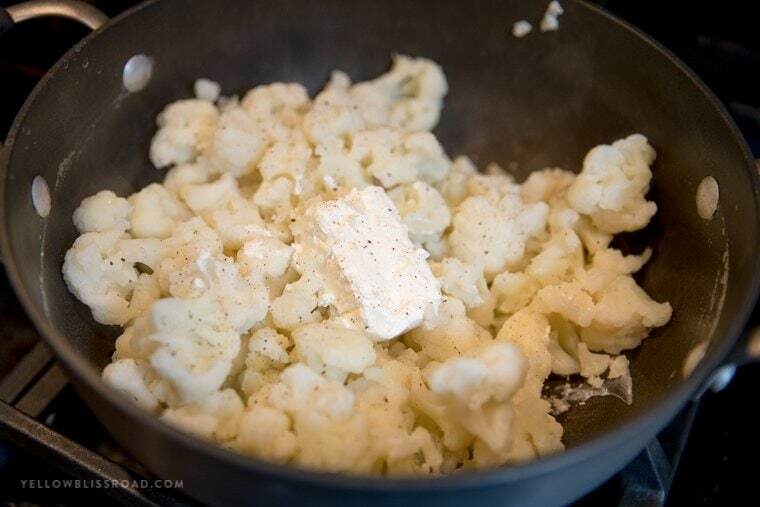 The cauliflower has a lovely nutty flavor and when cooked properly has a nice bite too it that mimics that of an al dente macaroni pasta. 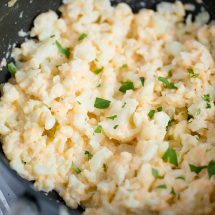 The cheese sauce is creamy and delicious and pairs so nicely with the cauliflower that you’ll never miss the carbs! I know I might be pushing it a bit, but if you’re really trying to cut carbs, this is a decent alternative to mac and cheese. Enjoy this easy one pan recipe as a side dish along with your favorite meals or as a main dish. We’ll be adding this to our list of the best Thanksgiving Side Dishes, so be sure to check that out too! 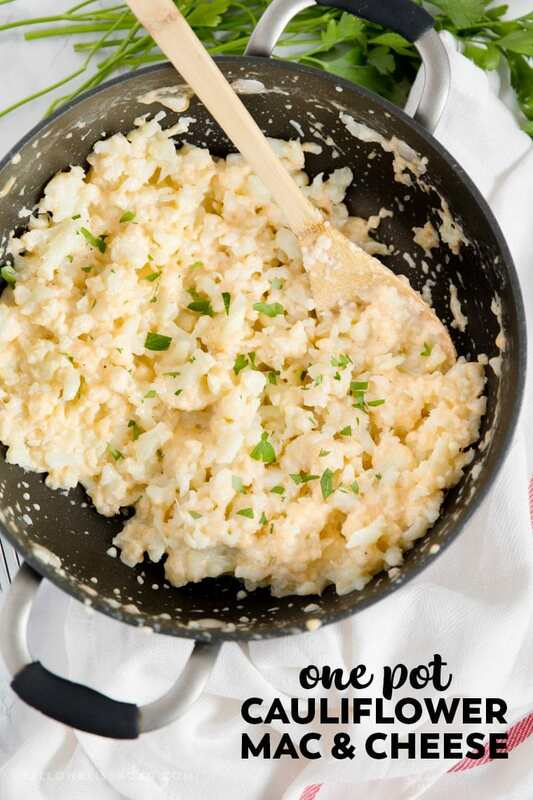 This One Pan Cauliflower “Mac” & Cheese recipe is a healthy, low-carb recipe that will satisfy your cheesy cravings. Makes a delicious and quick meal or a perfect Thanksgiving side dish. In a large pot, boil 6 cups of salted water. Add cauliflower and boil for about 5 minutes or until tender. Drain. Return cauliflower to the pot over low heat. Add a pinch of salt and pepper, garlic powder, paprika and stir to coat. 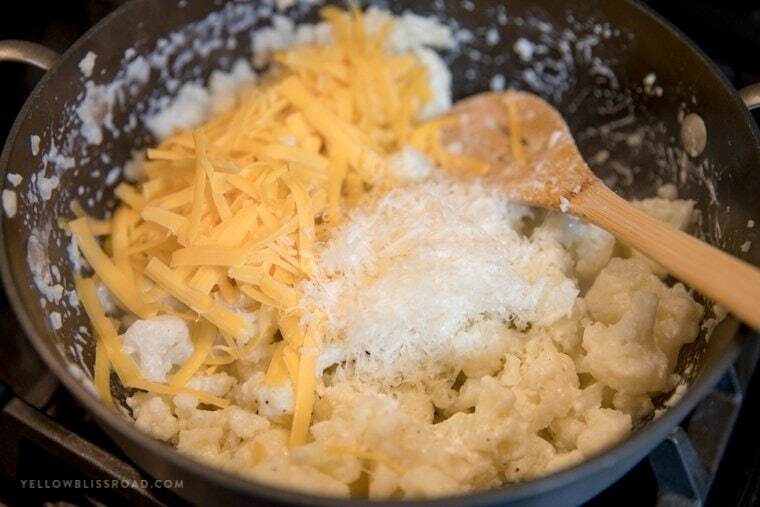 Stir in cream cheese, cheddar cheese and Parmesan until melted and combined. Remove from heat and garnish with fresh chopped parsley. 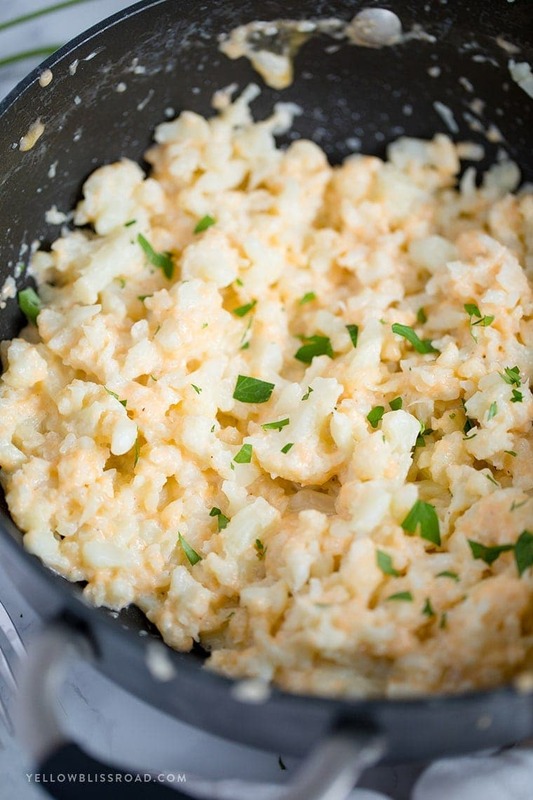 One pot cauliflower Mac & cheese…..Amazing recipe! Me & my daughter are trying the Keto diet and this is made several times a week at our house! So delicious but most importantly low carb! Thank you! If you thaw it first and drain any residual liquid, sure. Making this for the 3rd time since beginning of the year. It’s great tasting. Huge fan of Mac n cheese but stay away from actual pasta. Thanks for posting the recipe. Thanks Ed! Thanks for sharing your feedback! I served this with fish cakes and it was soooo good! My husband and I are watching our carbs and really enjoyed this. The recipe really reminded me of traditional mac and cheese… a real treat! Really good recipe! I do a lot of cauliflower substitutes just to keep the calories down and help limit my starches a bit. This is the best Mac and cheese substitutes recipe I have ever made. I liked almost more than the smoked brisket we had with it, and I love brisket. It says serve immediately. I was thinking of making it this afternoon and serving with dinner. Is there a reason I should not refrigerate before serving? It’s recommended to serve immediately because the cheese sauce can get too think as it stands. You might be fine reheating it if you add a little bit of milk and reheat on the stove. Is this recipe keto friendly? I love Mac and cheese, just can’t have pasta. I’m not a Keto expert so I can’t say for sure if it would be. You’d have to read the ingredients and judge for yourself. I believe I figured the net carb count. I came up with 2.7 per serving. I used a free carb count website. Excellent recipe. Followed as written with great success. Thank you. Can I sub yogurt for cream cheese? I haven’t used yogurt in this recipe so I can’t say for sure how it would work. However, I would be worried that it could separate. Probably worth trying though. Hello, Kristen. I am confused about the “210kcal”… Does that mean it’s 2000+ calories? The recipe has 210 calories per serving. Do you think this would be ok with riced cauliflower? Delicious! A great alternative to Mac and cheese, but also a great side dish on its own! Seriously, this was a great side dish. I used a little HWC to make it creamier. My family loved it. Can this be made without the Parmesan? I am currently out. Yes, I would just add maybe a little more of the cheddar. Just amazing! Thank you so much for sharing. This will definitely be a frequent dish at our house. Please list the fats, carbs & other necessary information for a proper Keto diet. I don’t see that information anywhere. Unfortunately since I am not a nutritionist I am not always able to provide nutritional information for each recipe. However there are great sites out there, like myfitnesspal.com, that can help. So really, we need 2 find this receipe on the Keto site so we can track it. Ugh……. Thank u anyway…. This isn’t a keto recipe site, so, yes. I made this a few days ago. It was soo delicious and so easy! My sister asked me to bring in to thanksgiving this year. Thanks again for the recipe. First, I’m soooo jealous that your family does everything CHEESE!! I could live off cheese, my family, not so much!! This looks sooo delish, I’ll probably be making this tonight! Question, have you made this w/o the cream cheese? I’m afraid that this would take it to another level of cheese that my send my hubby over the edge! Thx! I haven’t, and you could. The cream cheese helps to make the sauce nice and creamy, the way it would be if you were to go through the steps of making a roux with butter and flour and milk (like a traditional sauce). I say try it with and if they don’t like it, the more for you! Ha! Try it again with the cream cheese – so good!! This was lovely! Even better the next day. OMG, I’m blown away by how delicious this was. However, I did added crispy pancetta and that took it to the next level. Perfect Keto meal! Can this hold awhile before serving? The cheese sauce could separate…so I wouldn’t wait too long before serving. SO DELICIOUS! My family loved it! How do you count the calories and carbs? Do you put nutritional information with your recipes? One pot cauliflower macncheese. Calories, sodium, carbs, serving size? I think I calculated the carb count as 2.7 from a free carb calculator web site. Hope this helps. 128 grams = one cup – 4g Total carbs, 13 g fat, 6 g protein, net calories is 140. Hope this helps everyone.